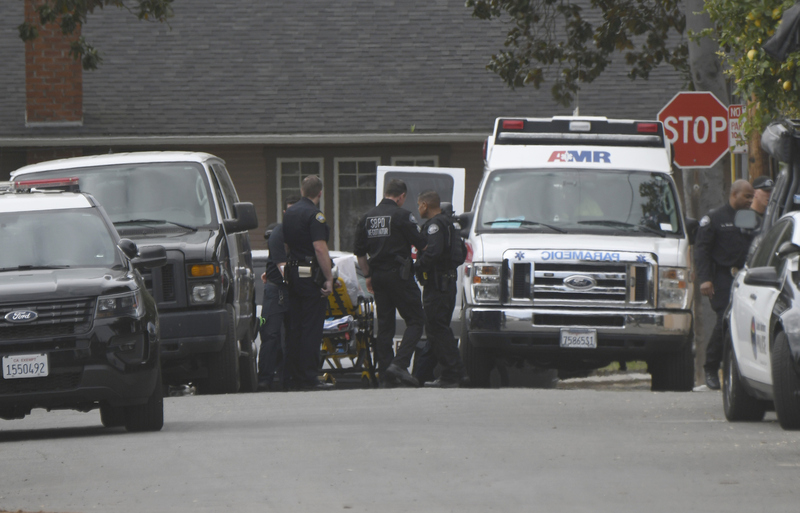 Photo: Paul Wellman Santa Barbara Police responded to the 900 block of East Mason Street this afternoon on a domestic violence investigation. A reportedly uncooperative suspect was taken into custody using a police K-9 and transported to Cottage Hospital from related injuries. Peter Freres, 55, was arrested and taken into custody on Wednesday after a concerned citizen called in a domestic violence dispute on the 900 block of East Mason Street. A police canine was used to subdue Freres, and he attempted to fight the dog, said Anthony Wagner, spokesperson for the Santa Barbara Police Department. Freres was taken to Santa Barbara Cottage Hospital for bite wounds before being transported to the county jail. SBPD received a third-party call reporting a domestic violence incident at 11:30 a.m. Police officers were dispatched and escorted the alleged victim to her home to retrieve medication. When officers tried the door, it was slammed shut and the deadbolt turned, said Wagner. The officers attempted to contact the suspect inside the home for several hours, said Wagner, trying to gain access and have him cooperate. As crisis negotiation teams talked with Freres, SBPD obtained a Superior Court warrant to enter the home. After Freres continued to refuse to cooperate, said Wagner, he was told that a police dog would be coming into the home. After a breach team opened the door, the dog, Loki, went inside. What ensued lacks detail as yet, but Freres was subdued and had bite marks at several different places, Wagner said. SBPD is investigating to better understand what happened in the house. â€œIt looks like it was a domestic dispute that involved battery,â€ said Wagner. He commented that there were several areas of blood in the street before police and K9 unit arrived. â€œThere was probably a pretty hellacious fight,â€ said Wagner.